Despite what the weather may have been like in your region this spring — fiercely hot for weeks or still cool and rainy — Memorial Day marks the unofficial start of Picnic Season. Grills are dragged out of garages and picnic baskets dusted off. Eating outdoors, after all, is one of the chief delights of summer. But wind, bugs, and soggy food can combine to make a picnicking excursion memorable for all the wrong reasons. Here are our tips for happy outdoor dining. #(clear n2). Chill it. Unless you're slurping from a water bottle and eating energy bars, you might want to bring along flexible ice packs, a thermal bag, or even a cooler to keep drinks refreshing and cool foods, like potato salad, from going bad in the heat. #(clear n3). 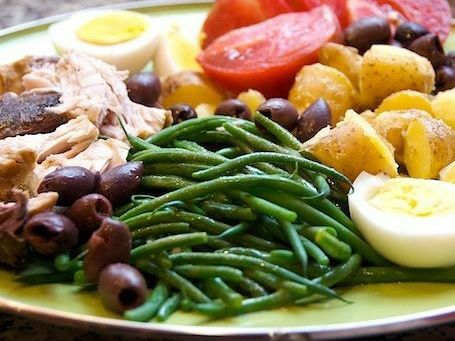 [%image reference-image float='clear right' width=450 caption="Make the components of a salade Niçoise and assemble the dish outdoors. "]Protect yourself. You know all this, but you tend to forget it anyways: Bring sunscreen (and yes, the stuff does expire, so buy it fresh every year or so), hats, and insect repellent if you think you'll need it. Also aloe for sunburn and extra clothing. #(clear n4). Get comfy. Something plush to sit on while dining is lovely, even if it's just your jacket. Broad picnic blankets are the classic tablecloth for your spread, of course, but if you can haul them, soft folding chairs are even better. You can even take a post-prandial nap in them, and they're excellent for holding down the corners of flyaway picnic blankets. #(clear n5). Bring more than food. Don't forget a corkscrew, bottle opener, penknife, serving spoons, napkins, wet wipes, garbage bags, and the like. It's easy to pack just the food and forget that you need to both eat it and pack it out cleanly. #(clear n6). Cook ahead of time. You don't want to be slaving away in the kitchen on picnic day, do you? Make as much food ahead of time as possible, preferably foods that can sit overnight and then travel well. Salads that won't get soggy and pressed sub sandwiches that actually improve while marinating are both good bets. Or avoid the mush factor entirely by making picnics that you assemble on the spot: spreads for bread, for example, or a composed salad such as salade Niçoise. And don't forget the classic dessert of early summer: strawberry shortcakes. #(clear n7). Don't cook at all. Avoid the bother of cooking and storing your picnic grub by bringing simple food: fruit, cheese, cold cuts, pickles, bread, cookies. Such meals are satisfying both for their taste and for their lack of bother. #(clear n8). Linger. Unless you're on a forced march of a hike, be sure to include time in your picnicking schedule for enjoying the view, the day, and a pleasant snooze after lunch. Because the picnics that you remember fondly aren't just about the food.